But Doctor Who fans are a hardy, persistent bunch and we’re not going to let scarcity get in the way if we really want to lay our hands on, say, a set of Wall’s Sky Ray cards or the annual with that alarming image of the Cybermen invading the TARDIS on the cover, are we? Join us as we take a brief tour of the weird and wonderful (if rather limited) world of Second Doctor merchandise. 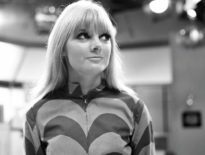 For the purposes of this guide, we’re concentrating on contemporary items produced at the time Patrick Troughton was the current Doctor. Let’s start with that good old Christmas standby, the trusty Doctor Who Annual. 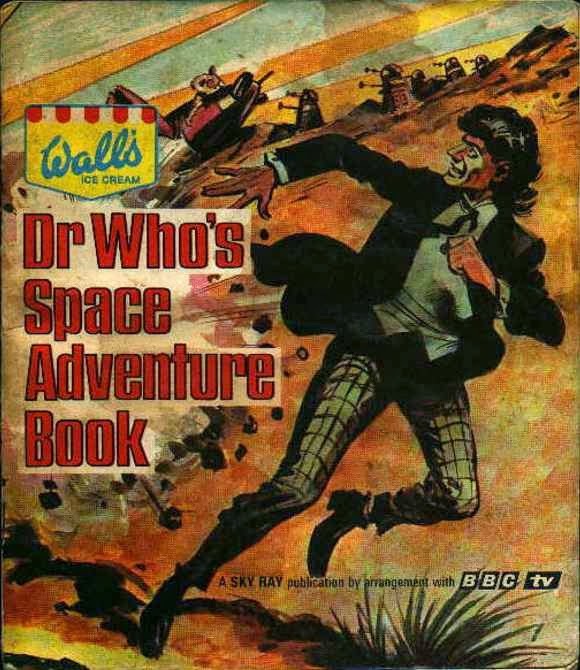 Three annuals were produced during Troughton’s time (in 1967, 1968, and 1969) and presented the familiar mix of comic strips, text stories, and space-themed features. 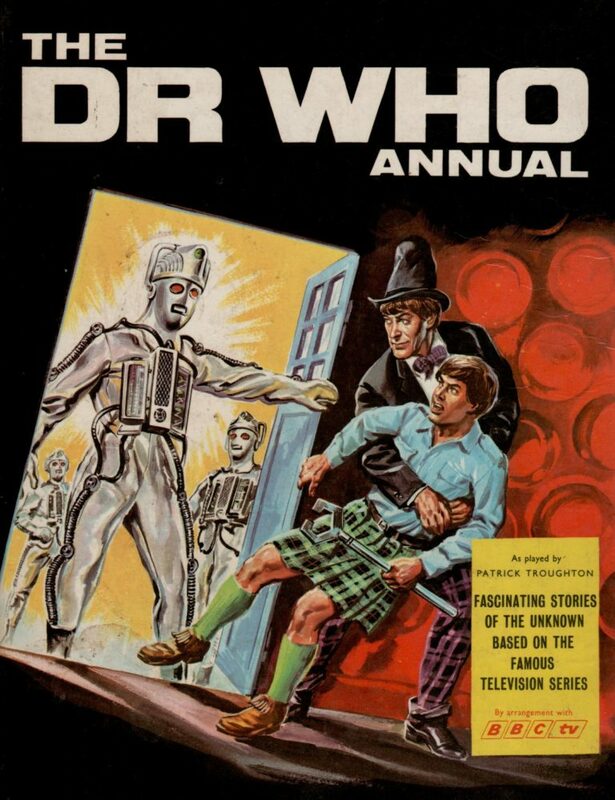 The most eye-catching cover is the aforementioned one on the middle annual, although young readers would surely have been disappointed to discover that the Cybermen don’t appear inside. 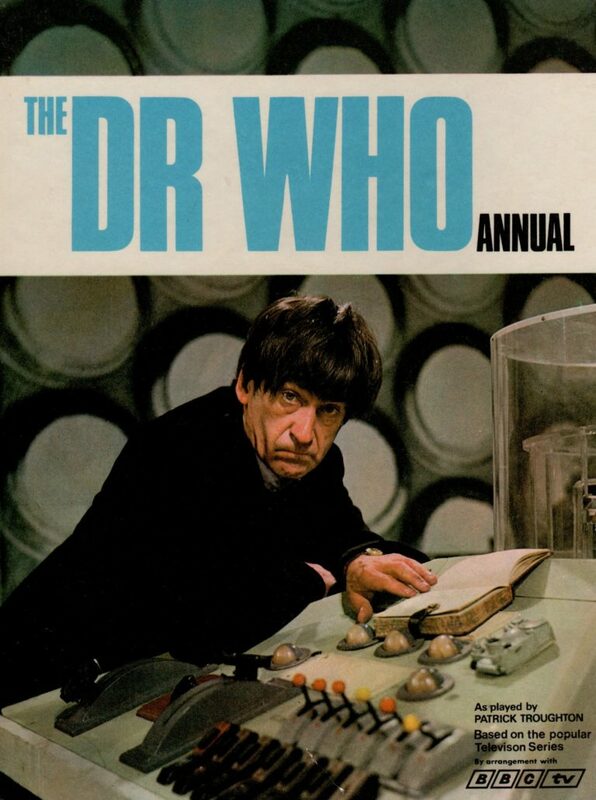 The first Troughton annual is notable for The Phoenix in the TARDIS – an article explaining the change of Doctor. This is one of the earliest non-fiction articles about the series; arguably, it featured the first reference to the term ‘regeneration’ in regards to Doctor Who, some six years before it was first uttered on-screen in Planet of the Spiders. Though it called the actual process ‘rejuvenation’, it does refer to this new incarnation as a ‘regenerated’ Doctor. 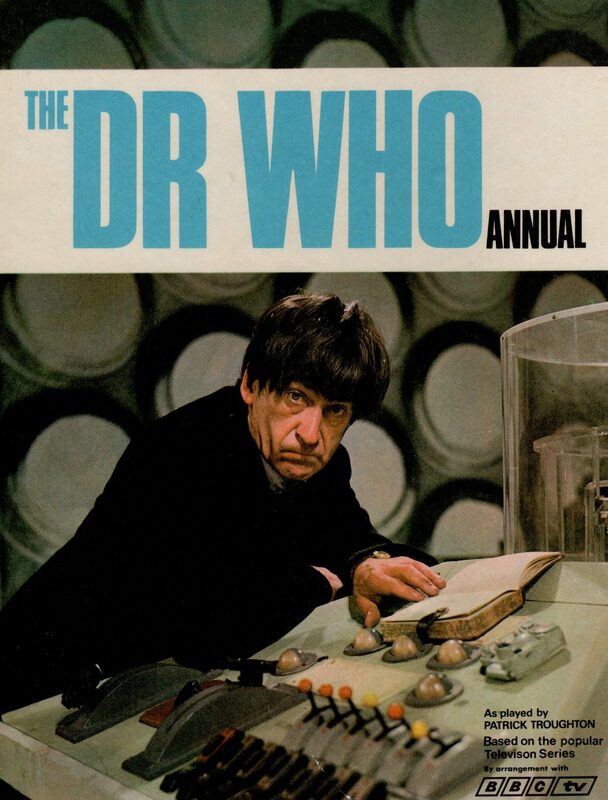 The Troughton annuals are actually harder to find than the earlier Hartnell ones, probably due to lower print runs and sales in this period, and as ever with old merchandise condition determines value – expect to pay upwards of £60 for a good quality copy of any of these books. 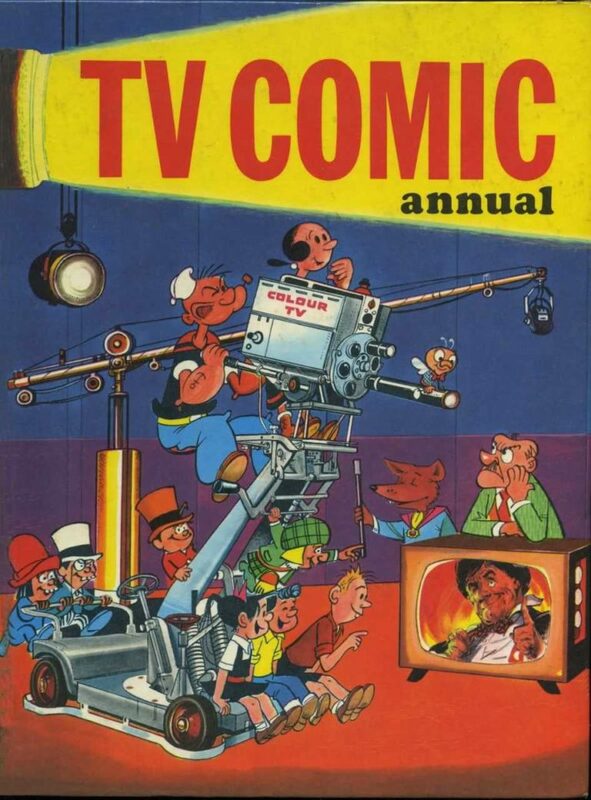 You may have an easier, less expensive task in tracking down TV Comic annuals from this era. 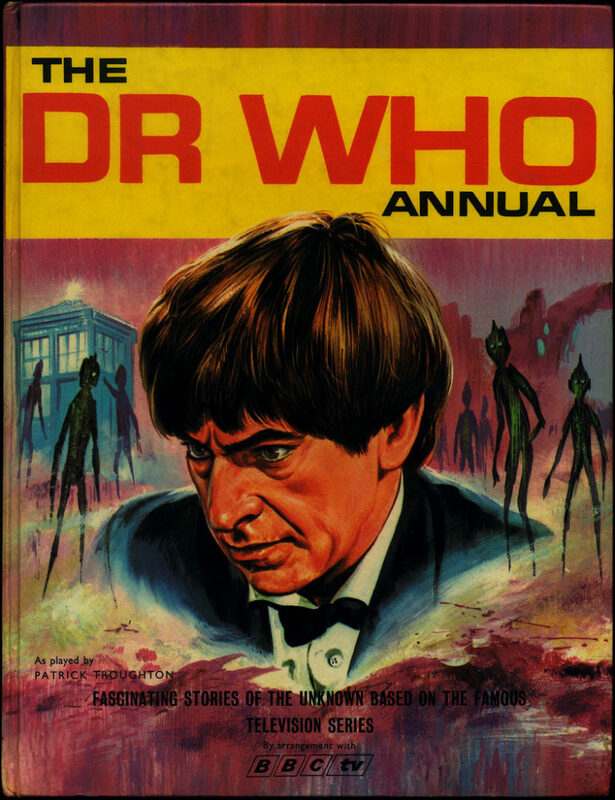 The Second Doctor was a key element of this publication’s roster of on-screen talent at this time, as evidenced by his appearances on the cover alongside Popeye, Olive Oil, and other less well-remembered characters. Which brings us to this Doctor’s adventures in comic strip form and that near-legendary quotation in the title of this article. 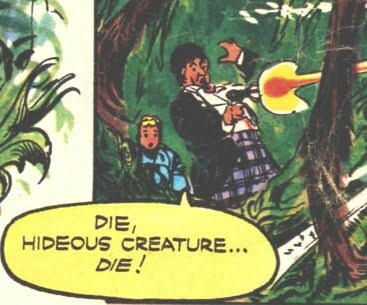 Lifted from Master of Spiders, a 1967 TV Comic adventure which sees the Doctor trying out his new ray gun and gleefully blasting the villain of the title to smithereens, it’s a panel which gloriously encapsulates the lack of familiarity that writers and artists tasked with creating stories had with the programme. 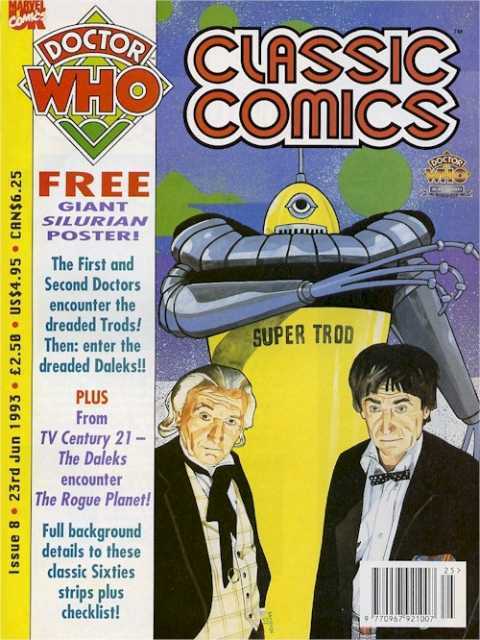 The Second Doctor appeared in almost all issues of TV Comic throughout his three years on television. 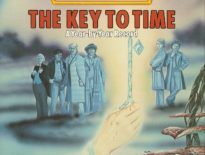 It’s fair to say that maintaining consistency and continuity with the parent show was not a priority, although the publishers did manage to set the Doctor against the Quarks in a story (Invasion of the Quarks, issues 872-876) which ran at the same time that The Dominators was airing, perhaps hoping that the new enemies would be a lasting success (indeed, their creators, Mervyn Haisman and Henry Lincoln envisioned that they could take over from the Daleks in popularity). Individual issues of the comic of this vintage are very rare and you’ll have more luck finding samples of the strips in copies of Doctor Who Classic Comics, the short-lived stablemate of Doctor Who Magazine which reprinted old comic adventures in the 1990s. 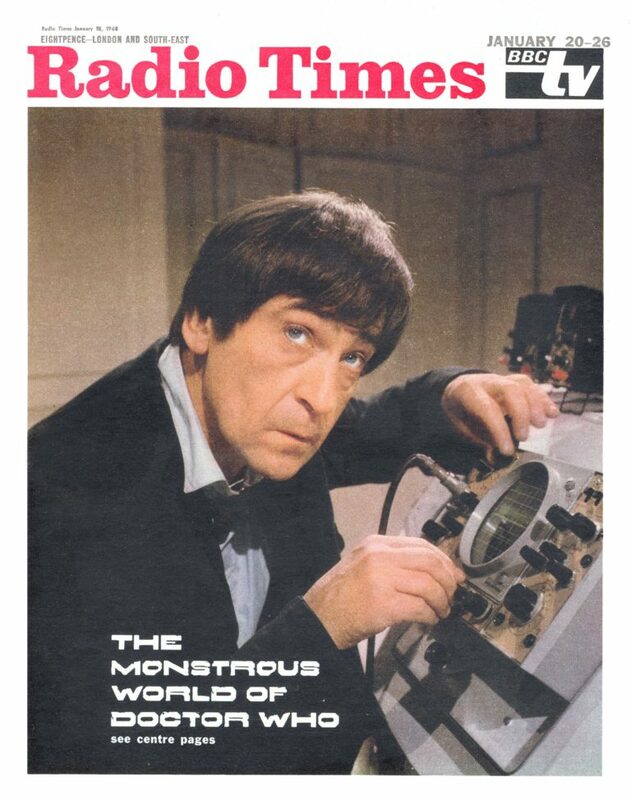 Staying with news stand publications, Troughton’s Doctor enjoyed relatively frequent high-profile exposure in the BBC’s listings magazine Radio Times with three cover features during his tenure (although only one of these depicted him). Copies are likely to be listed with the heading ‘giga-rare’ (and have a price tag to match) should you come across them on eBay, although a more affordable option if you want a memento of these and other vintage Doctor Who covers is to track down the two sets of postcards given away with the magazine in 2013 (I can speak from experience in saying they look terrific in a frame on the kitchen wall…). No guide to Second Doctor merchandise (or, I would argue, to the series as a whole) is complete without an honourable mention for classic confectionery, the Wall’s Sky Ray. The 1967 promotion for this kids’ iced lolly saw a set of 36 picture cards accompanied by Dr Who’s Space Adventure Book, an annual-style publication. The cards could be used to illustrate the Daleks Invade Zaos adventure inside the book, which also included games and an extensive explanation accompanied by diagrams of the Doctor’s links with the Sky Space Raiders, an anti-Dalek force who flew through the galaxy in a craft that, conveniently, closely resembled the lolly. The promotion is most notable for giving Doctor a rare outing in a commercial for the product, with the director making a game if doomed effort to cover the fact that Patrick Troughton was not involved. And that is about it as far as contemporary Second Doctor merchandise goes (although if we’ve missed anything, do let us know in the comments). Compared to the glut of stuff released in the programme’s first flush of success in the Hartnell era, the Troughton years do seem to have been a comparative drought. Though the series was still a solid performer in the ratings, that extraordinary surge of enthusiasm and interest in Doctor Who triggered by the success of the Daleks had passed by the time the Second Doctor appeared so it’s perhaps not surprising that manufacturers, ever-keen to latch on the next big thing, had begun to turn their attention elsewhere. It’s worth remembering, too, that there would surely have been a good few Dalek Rolykins and the like still available in the shops at this time. But as we’ve seen, the relative paucity of goodies produced in Troughton’s time means that the joy of discovering something bearing his image, even if it’s a somewhat iffy drawing or a bloke covering his face whilst pretending to be him, is all the greater.